Take to the stars in Nova Raider as you do battle in the dangerous depths of space against fearsome alien enemies, enormous World Bosses and even other players in exciting PVP combat. This free to play MMO is a simple yet fun point and click-based MMO using cutting edge graphics for a browser-based MMO, iOS app and even Windows client download, making this cross platform game extremely accessible regardless of your available hardware. Once players have registered their account online they will quickly jump into a world of exploration, trade, research and combat against challenging AI and real world players. When players have played through some of the initial missions that act as a tutorial, letting players get to grips with some of the basic functions and key features, they are able to choose their own ship class from the five available choices in the game. Each ship class is made up of four primary attributes; its Attack power, its Defensive rating, Support/Heal/Drone abilities and its Trade. Each of the other four classes excel greatly in one of these areas at the expense of being weaker in one or more of the other three stats. The first choice is a Balanced ship, not specifically a class but more a ship that is suitable for new players or those that do not wish to have any major weaknesses for their ship. The Raider has strong Attack, making it an ideal DPS class, but as expected has weak Defence capabilities; in contrast the Tank has high shield/armour rating and an improved Defence but does not put out as much firepower. The Support is best utilised on the backline helping teammates and keeping them alive with both buffs and its heal abilities, though is also skilled at dealing with enemy drones, whereas the Trader class is primarily focused on having a higher cargo capacity and able to loot more minerals to trade at the market but is extremely weak in combat and has abilities to try and avoid it altogether. Minerals play a key role in the game, players can gather them from missions, enemy drops or simply loot them from around the various galaxies. When enough of a single type of mineral has been acquired players can combine them into a powerful gem, which when equipped to a players ship can give it powerful passive benefits such as improved attack, defence, crit rating and other boosts. 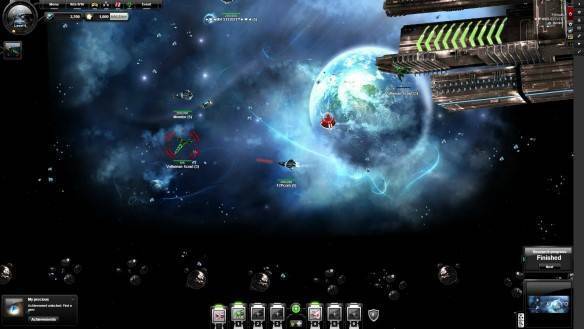 Players can kit their ships out with a variety of other weaponry and gear, typically unlocked as they level up or through the Research system where players can spend the Uranium currency to try and increase the quality of their gear. Uranium is earned through killing enemies, completing missions and through other content in the game and is the standard in game currency used to restock and repair your ship. A Stars currency is also available, a premium currency that players can purchase using real-world cash should they find themselves short on Uranium.